This taco soup recipe will allow you to put a healthy meal on the table in a matter of minutes. Not only is this a “comfort” food, you can feel good about serving it to your family. Especially when you use my homemade taco seasoning. It’s way better than store bought and is better for you. The flavor is so hearty that it tastes like you have been cooking all day. I make this recipe and serve it to my family at least two to three times a month, and sometimes more often. It is so easy that even the most inexperienced cook can make this. As long as you can open a can and fry some meat, you are good to go. Here is a tip for you: This recipe freezes really well. Double the recipe and freeze what you have left over. 3 Tbsp. Robin’s taco seasoning. Saute the chopped onion in olive oil on low until the onion is caramelized and golden brown. This will probably take about 35 minutes. The longer the better in my view. After 35 minutes, add the garlic and cook an additional 2 minutes stirring frequently. This brings out a real nice flavor if you have the time. If you are short on time you can just cook the onion and garlic with the meat. If you are cooking the longer version, place the onion/garlic mixture in a stock pot. Back to the frying pan. Place the heat to medium high and add the ground beef. Don’t add any seasonings yet. Cook and break the beef apart until there is no pink remaining. When the meat is done, drain the grease. Pour the beef into the stock pot with the onion/garlic mixture and add the fire roasted tomatoes, tomato sauce, kidney beans, corn, and my taco seasoning. Stir to combine. Bring this to a boil and then simmer with a lid for 20 minutes. To serve this dish, garnish it with sour cream, grated cheese and slices of avocado. And don’t forget to sprinkle those corn chips on top! They are amazing with this. 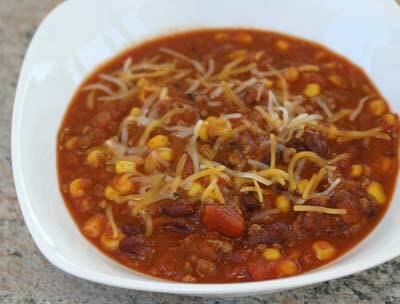 This taco soup recipe is great with warm, out of the oven cornbread. Serves 6 to 8 and freezes well. Click here to watch my Taco Soup Recipe on YouTube.